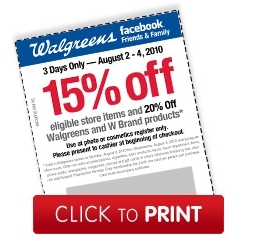 Walgreens: 15% Off Coupon For In Store Purchase! Walgreens has a Friends & Family coupon for 15% off in store purchaes and 20% off Walgreens products. You can head over to the Walgreens Facebook page and “Like” them. Once you do you’ll be able to print your coupon. Coupon is good from 8/2 – 8/4/10. New Coupons: Hefty, OPI & Ball Canning!